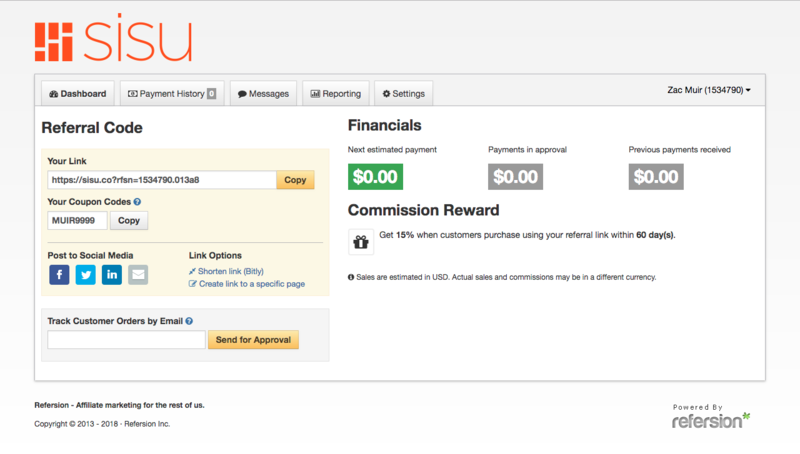 Run your own referral business with the Sisu Affiliate Program. We're all about creating win-win situations over here. The world's most successful people are frequently obsessed with the idea of passive income. It's how you create recurring value, year after year while freeing up your available time to add even more value. That's what we offer our affiliates. In return, you help us spread our platform and message throughout the industry, adding value for every agent or team who decides to revolutionize their team and processes. So, I guess we could say this is a win-win-win. First order of business is welcome to our affiliate program! We are very exclusive as to who we want to represent our amazing Sisu product and be part of the culture of accountability that we are building in the community. From there, you'll have a dashboard to manage everything about your business. It will tell you what payments are coming down your pipeline, as well as your unique referral (coupon) code and link tracking cookie. One of the best ways to leverage your industry experience, is to personalize your messages and share your affiliate link on social channels, and in your referall communications. Maybe you just want to share our most recent blog on social media to introduce someone to Sisu. All of these methods are at your disposal with our program, and you can make sure you get credit using your link tracking code. Once again, it's found on your main dashboard. This link plants a cookie on anyone's browser who clicks it. The link part— https://sisu.co — simply leads someone to our website. You can share that link and get credit for anyone who signs up, but you could also use the second portion of that link on any webpage that you would like to share? Cookies will last 60-90 days, depending on your status in our affiliate program. That means that anyone who hits your link will be credited to you for that entire period. We do our best, but cookies are not always foolproof. Some people browse in private windows, where cookies are not allowed. This is not common, but it happens. Potential customers could also remove cookies, which could impede tracking. Overall, however, cookies are very effective and allow you to share messages with the masses and see real results. Your social network is a perfect source to promote the Sisu solution and earn additional income. Choose the Facebook icon, login to your Facebook account and post a personalize message to your page, real estate groups, or other pages. Twitter, LinkedIn, and email link sharing all works the same. As mentioned, a personalize message to your network is by far the best way to leverage your industry experience. We have some amazing industry blogs that you can leverage in your affiliate promotion. Linking directly to that page and then sharing your affiliate link is the perfect way to promote referral engagement and purchase. 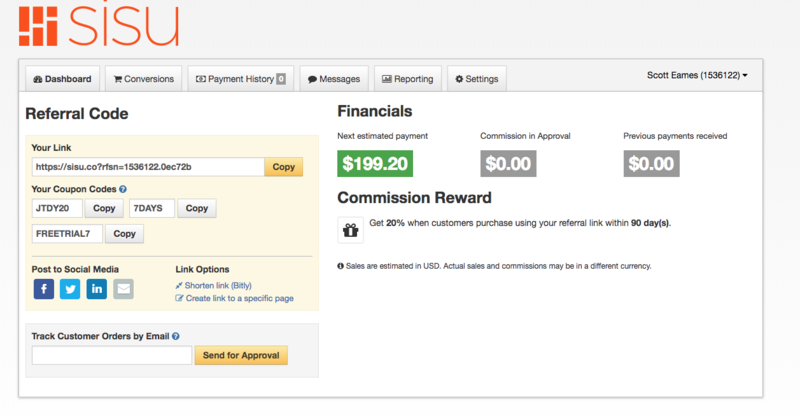 Our Affiliate Program and referrals are our best source of customer acquisition. That is why certain customer discounts are ONLY available through our Affiliates. Using your coupon code is the best way to ensure that your referrals receive these discounts and count your sales. You'll want to promote it wherever you can–on your blog, via social media, in person, etc. We want to make sure you always get credit for your influence, so we're actually incentivizing new customers to use your coupon code. 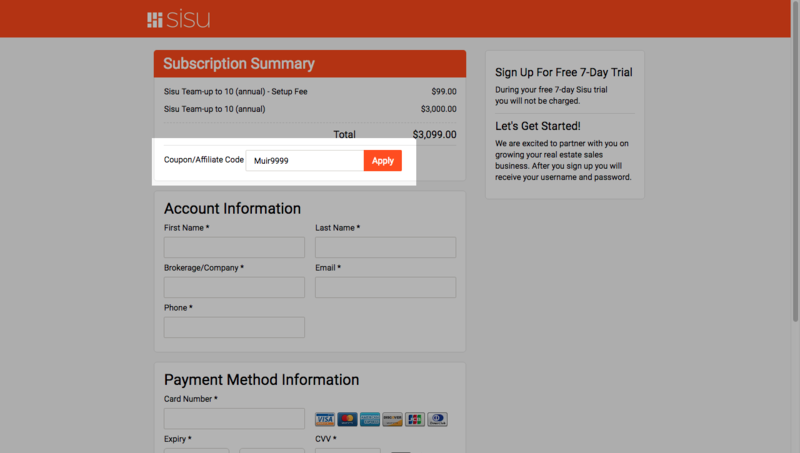 When they use it, they'll automatically get $99 one time discount off their purchase for Sisu Team customers (typically applied to their setup fee). Customers can use this coupon code on our checkout page when they purchase the product. Social media sharing also presents a unique opportunity. You can choose to share our main website right from your affiliate dashboard, and you'll be credited for any link clicks. There is also an option to track via email addresses. These can be entered from your dashboard and approved by our team. Anyone signing up with that email address will be credited to your account, allowing you to market via email or make an introduction to our team. The first step is to setup a PayPal account where we will automatically send you your monthly affiliate payments. It is simple to do and PayPal is a safe merchant services solution that is one of the first industry leaders in the space. Your PayPal account will be linked to your checking or savings account. If you don't currently have a PayPal account, the button below will get you started. Once you have your PayPal account established, you merely have to enter in your email address associated to your PayPal account and your all set. Finally the good part. Just like in Sisu, we always want you to know the financial outcomes of your hard work. 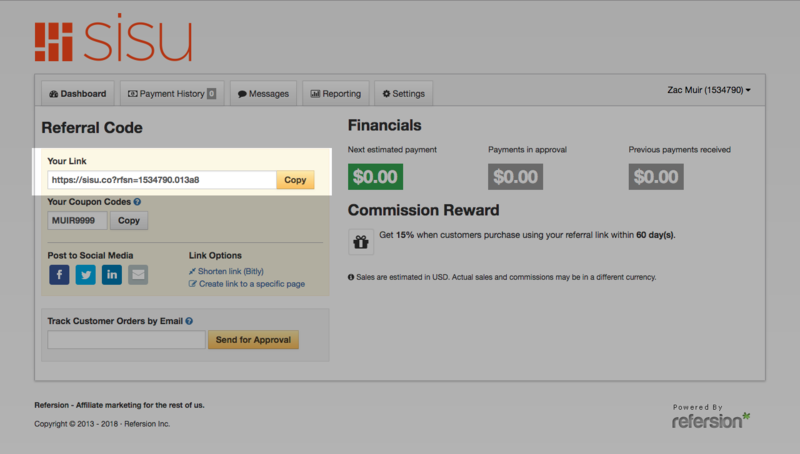 Tracking pending payments and payouts is really simple in our affiliate system. 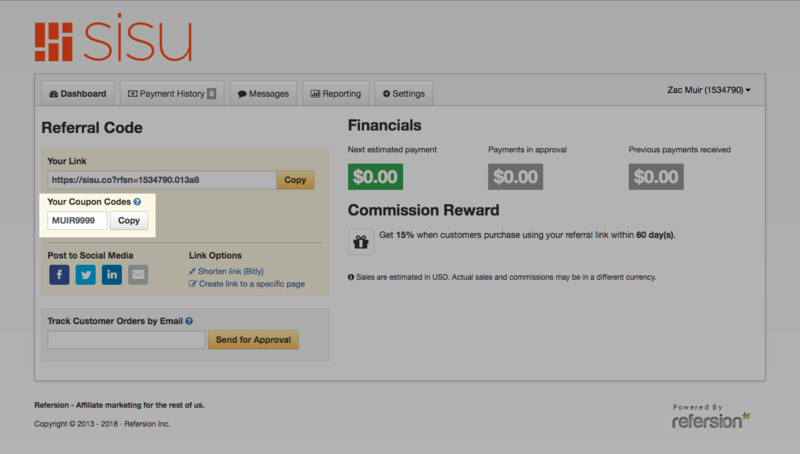 Your affiliate dashboard displays your next estimated payment, commissions in approval and previous payments received. Once again, we are honored and excited to have you as an affiliate. We would highly recommend subscribing to the blog and watching for weekly content. This will open doors for conversation and allow you to continually drive passive income. Good luck out there, and reach out to our team for any support needs!